Recently I had the opportunity to sit down with English actor, self proclaimed method actor, Richard Armitage at ‘The Hobbit: An Unexpected Journey’ press junket in New York City where we discussed his role as “King Dwarf” Thorin Oakenshield. 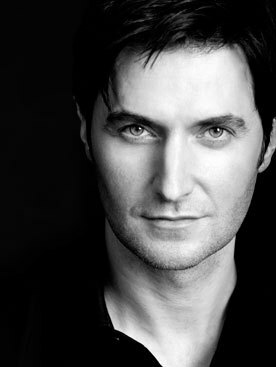 Armitage is known for his roles in the BBC series ‘Robin Hood’ as Guy Gisborne, ‘North and South’, ‘ShakespeaRe-Told’ series as McDuff in Macbeth and other starring roles in film and television. I was led by his assistant to the hotel day room where we were to interview. I entered to see a very relaxed Armitage sitting on a couch. As I was introduced to him by the assistant, he stood to greet me and shake my hand. Richard Armitage: How long do you get? Steve Fitch: Well, they told me at least an hour. Richard Armitage: Okay, that’s cool. Steve Fitch: (laughing) I’m just kidding. Richard Armitage: (laughs) At least we can have a glass of wine at the end of it. Steve Fitch: Oh, of course! For sure. No, just ten minutes. Richard Armitage: You take as long as you want. As we sat down from our introduction and pleasantries, the interview began. Steve: Well, I’ll start by saying that this will be my first sit down interview ever. Steve: Yes, you’re my first. Richard Armitage: Am I? Well, I’m very proud to be. Steve: I’ve done many interviews over the internet or through email, like recently with John Howe. Richard Armitage: Oh, he’s such a nice man. My God, that man. What a talent. They’re one of the reasons why I was able to take the role. I can never remember whether it was Alan…let me Google it. There’s a sketch of Thorin, a pencil sketch…oh, it’ll come to me… from one of them. Which one of the does them very fine pencil sketches? Because they paint differently, don’t they? Steve: I think it’s John. Richard Armitage: It’s John’s sketch of Thorin, then, and he’s got his hands crossed. That’s what convinced me I could play the role. Steve: They are great artists. Steve: And they always seem to downplay it. Richard Armitage: Totally. They were embarrassed to go on set; they thought they’d be in the way. I’m like, “You designed this. This is your world. Come on in.” Amazing people. Steve: You’re known for being a very detailed actor. You dedicate a lot of extensive time and research to your roles. What kind of prep did you do to get ready for the Thorin role? Richard Armitage: Before I went to New Zealand, I did have quite a lot of time, so I obviously started with the book and looked at the Appendices in ‘The Lord of the Ring’s. I didn’t really read ‘[The] Lord of the Rings’ because I’d read it as a kid. But I just started looking at a lot of other Tolkien work. I looked at ‘The Silmarillion’, I looked at ‘The Book of Lost Tales’. I looked at a lot of biographies about Tolkien because I wanted to understand why he’d written ‘The Hobbit’ and what had influenced him to write ‘The Hobbit’. 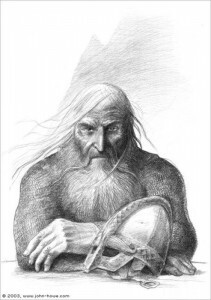 He wrote a lot about dwarves and the Nordic aspect of it and his fascination with language and etymology. So all of these things I was just interested in. I didn’t know whether I was going to be able to use it. Steve Fitch: When you were preparing before and when you finally got to set, going along with the democratic part of it, were there some realities or changes that you didn’t expect of how Peter wanted it to go? Richard Armitage: The one thing I didn’t expect was the fact that we were going to be bigger. When we get into costume, we’re all massive. So these dwarves are huge. I was a bigger version of myself. I was taller and wider than I am (obviously, because Pete shrinks you on the computer). I always thought that I would be small, but I was big. But it was very useful, and I didn’t realize it at the time, but in retrospect, it’s become clear that the growth in size has really helped to form this subconscious ego that I think dwarves have. When you look at the designs for Erebor, it looks like Mount Rushmore. They built massive monuments to themselves, they accumulate huge amounts of wealth, they think a lot of themselves because they are a forbidden race. They are secondary to elves in the Legendarium. Steve Fitch: You talked in the press conference earlier about the influence Tolkien had with Catholicism. And it’s funny, because not many people really know the background. That’s what Tolkien had actually said himself, that he had written that for a Catholic audience. Richard Armitage: Did he say that? See, I didn’t know that. I just knew that he had that faith. C.S. Lewis definitely wrote religious allegory, and they were close friends. I think they read each other’s work and were influenced by each other. There are just themes that run through his work that you look at and you think, “Why does this resonate?” I’m not religious, but it feels like a sacred moment. And these amazing lines that—I don’t even know if it’s Tolkien anymore or if whether it’s [Philippa]Boyens—that amazing line that Gandalf says when he gives Bilbo Sting. He says, “True courage is learning when to spare a life rather than when to take one.” I mean, could that be more Catholic, Christian, whatever faith? I think also his experience of World War I, whereby his very, very close friends lost their lives and he came back changed. And I think that’s what ‘The Hobbit’ is about. Steve Fitch: You said in a previous interview that you live with the characters that you’re playing in your projects and that they become part of you while you’re working. 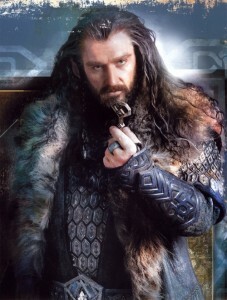 Have you kept a little bit of Thorin? Richard Armitage: I’ve had to because we’re not done yet. And actually, coming back to do all of the press stuff, I went back to my notes. I was like, “Yeah, you know what? Just go back to those details and things that you wrote down, the ideas that you had.” My brain is like a sieve; it just drains. I suppose just because I don’t that I’m good enough to just go, “I can do it now.” (snaps) I’ve got to keep it there in my head. I’ve got to concentrate on it. But there was one period whereby I started to dream about going through the door. Through the course of a week, I remember having this constant dream of opening a door and walking down a corridor. 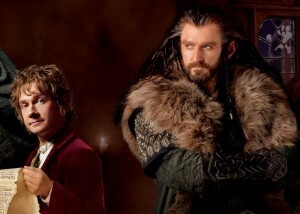 I was kind of dreaming Thorin’s dream. It’s funny because it sort of got mixed up with another character where I used to start dreaming in the character. I suppose I was going to bed programming my mind to dream because I’d been reading stuff. I’d been reading about that moment where they open the door in the script, so whether or not it’s the character dreaming or me dreaming about the character…It’s nice to wake up in the morning, remember that dream and go, “Ah! I’m going to just jot some notes down of the things I saw in that dream, so that when we come to shoot it, I can use it,” because that’s the subconscious. It’s just brilliant when you can totally let go of control. Steve Fitch: So do you have that kind of Thorin attitude when you’re out buying a coffee at Starbucks? Steve Fitch: Oh, for sure. He wouldn’t have to wait. A lot of media out there have referred to ‘The Hobbit’ as going to be bigger than ‘Avatar’. Steve Fitch: Even [James] Cameron has stated that he’s watching to see how the 48fps goes. And if it goes well, then he’s going to jump in and do his other two ‘Avatar’ films with it. A lot of pressure and expectations. Being part of the project, how is this influencing you? Richard Armitage: You know, it’s weird because the discussions happening amongst us are really interesting. There’s a part of me that is so proud to be in that first experiment whereby the cinema is being pushed forward—not just visually, but in terms of sound. But there’s also the anxiety that that will be the talking point, rather than characterization and story. But I’m proud to be part of something that will divide people. It will. I do think people will say, “I hate it. I hate 48 frames. I hate 3D. I want old-fashioned cinema.” I can be a bit like that. I don’t need 3D. But then when you see that finished film, you’re like, “Well if you can do this, then why not? Why not have this as a choice?” You can go and see it in 2D on IMAX, if you want. You can go and see it at 48 frames if you want. There is no definitive perfect version of the film. What is really interesting is that I remember seeing ‘Avatar’ in 3D at the cinema, and then when the DVDs were released, I was like, “I’m not interested. I don’t want to see it in 2D because now that I’ve seen it in 3D, I don’t ever want to see it in any other format.” So, I don’t know. I’m kind of proud to be part of that cutting-edge. Steve Fitch: Peter [Jackson] said earlier in the first press conference…It was funny, because I was talking to a bunch of other media about it. About the day that cassette tapes stopped and CDs just started, and we had to deal with it. Richard Armitage: I remember (laughs) very clearly. There’s a famous electrical store called Dixons, and they were like, “Today is the day when Dixons have declared that tape recorders will no longer be made, so anyone that has a cassette tape will never be able to buy again.” And it’s like, everything moves on. I know that there’s a retro feel for vinyl. And there will always be film. There will always be black and white movies. But if you don’t push it forward…I admire Peter for wanting to get people into event cinema, because otherwise people will be watching it on that. (Points to phone) They’ll be watching it on an iPhone. And that’s no experience, is it? You want to sit in the cinema. And you want to sit in the cinema with an audience full of people. Steve Fitch: It’s the whole movie experience. Richard Armitage: And it’s also taking your family to see something, because there are so few things that you can do together as a family. There’s not very much at all that you can do. And the fact that this is a Christmas movie is great, and I really hope that Mom and Dad take the kids to see it, and then on Christmas day, they open a book of ‘The Hobbit’ and they go, “Oh look! This film I’ve just seen. Let me start reading it.” I really hope that they do, you know, and then go play with the LEGO set. (laughs) Whatever it takes to get that imagination going. And hopefully they’ll go back and see it again. Steve Fitch: Peter had also said earlier—and I thought it was interesting, because he makes a good point—that Bilbo is a big part of the book, but arguably, it’s the story of Thorin. Richard Armitage: Yeah, and I never had this conversation with Peter, because he has the conversation through the process. But he said something in the press conference which I was like, “Actually, that’s the nail on the head,” and that’s that Bilbo is absolutely the heart of the story. He’s the beating heart of the story that you want to protect and you want to make sure survives. Thorin is the soul, really. He’s the experience, he’s the spirit of the dwarves and their kingdom and this whole bowl that holds the heart in their hands. And that’s how I see it. And they sit in harmony with each other, I think, and are changed by each other. It was then that the assistant had come in to let me know that my time had come to an end. Immediately we stood and shook hands. Richard Armitage: Great first interview. Steve Fitch: Thank you. You are being very kind. Richard Armitage: (laughs) No, you were brilliant. I hope you do many more. Richard Armitage brings a driven and dedicated passion to the role of the powerful, Thorin Oakenshield. ‘The Hobbit: An Unexpected Journey’ opens in theaters December 14th.